This winter’s polar vortex and the insane cold it wields in its icy grip is making our minds wander. We’re dreaming of bathtub-warm blue waters, palm trees, and living beachside in tropical climes. Say, the Caribbean or Central America. We hate to rouse you from this intoxicating reverie, but buying a beach crib in these locales isn’t exactly cheap. Or easy. Picturesque villas usually boast seven-digit price tags, and affordable options might make a Fyre Festival tent resemble a dream home. Add in a daunting blend of foreign buying restrictions and regulations, unstable local economies, as well as crime, and your beach fantasy can turn into a living nightmare. Answers, you say? We have ’em! The realtor.com® data team has pinpointed the top Caribbean and Central American beach towns right now for Americans looking to make the plunge into international real estate. We found 10 towns outside the U.S. with a solid mix of safety, affordability, great beaches, and easy-going real estate rules. We made sure these towns are great for both full-time expats and folks planning to buy a part-time vacation home. To arrive at our ranking, we first ruled out countries where buying real estate is overly restrictive for Americans. Adios, Cuba! Au revoir, Haiti! With a watchful eye on affordable options for Americans with wanderlust, we gave the heaviest weight to home pricing. After determining the top countries for expats, we found the best beach destinations with the help of publications such as Condé Nast Traveler and TripAdvisor, then we checked to ensure the nearby towns met our affordability goals. So burn that parka, scatter the ashes, and have a look at these sandy investments for savvy buyers. Finding sandy, white beaches with clear-blue waters in the Caribbean or Central America isn’t difficult. But Tulum separates itself from the destination pack by offering a lot more than beautiful beaches (although it has plenty of those). Way down in southern Mexico on the Yucatan Peninsula, the oceanside town is home to the Playa Ruinas, well-preserved Mayan ruins along the edge of the Caribbean Sea. It’s also home to one of the top culinary scenes south of the border. Over the past decade, Tulum has watched its expat community explode. We can see why: Snorkeling in the azure waters can feel downright decadent, and dining on the day’s catch is tough to resist. And as more expats continue to talk up the virtues of Tulum, new homes and restaurants are under construction. So, the secret is a secret no longer. But while prices in Tulum are high relative to Mexican home prices, they aren’t out of reach. This one-bedroom condo comes with a private swimming pool, but is priced at just $139,000. Many of the homes and condo buildings are closer to town, a 10-minute drive from the beach. But American buyers need to do their research before buying in Tulum: Mexico prohibits buying in some areas on the beach and requires foreign buyers to set up a trust through a Mexican bank. About 100 yards downstream from the Sulphur Springs, where volcanic activity forms hot pools, folks visiting the beautiful island of St. Lucia can wade into the hot mud and get dirty—in a good way. Rodney Bay is a bustling area with the best shops, bars, and restaurants on the island. Cruise ships also dock in the area, which means there’s a regular inflow of tourists. But finding a home, many of which are a quick walk from Reduit Beach, can be a murky endeavor. In order to buy property, Americans must hire an attorney (for about $5,000) to acquire a local license. For a sense of what’s available, we found a three-bedroom home for $495,000. Dominical sits at the meeting point between the jungle, mountains, and the Pacific Ocean—and the elements combine to create spectacular views. The town is home to Dominical Beach, where rough waters and 10-foot waves have long made it a hot spot for surfers, but since the early 2000s it has seen a building boom and an influx of expats. “Surfing is a big deal in Dominical: 365 days a year you have a wave to surf—not many places around the world can say that,” says Clinton Stephenson, an investment consultant at Costa Rica Real Estate Service. As a result, Dominical is a hub for thrill-seeking Americans and Canadians. Stephenson says home buyers here tend to snap up Spanish Colonial–style homes with red tile roofs. Overall, prices on a single-family home range from $250,000 to over $4 million. Dominical sits at the water’s edge, and many of these homes are just a 10-minute drive or short walk from the ocean. 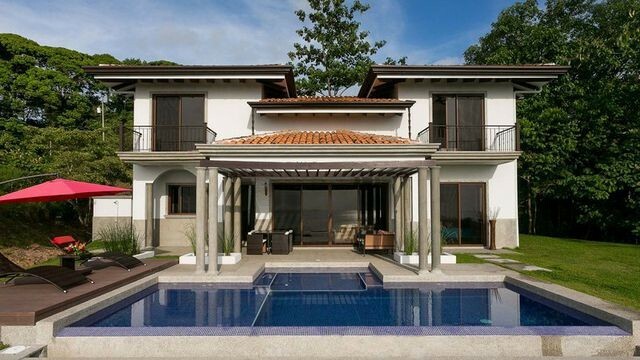 American buyers will also enjoy Costa Rica’s low, low property taxes—which amount to around 0.25% annually. In addition, Costa Rica property laws are fairly easygoing and foreign home buyers are treated the same as locals. “The Dominican Republic is still remarkably more affordable than many nearby islands,” says Tony van der Heijden, a broker and co-owner of Immomexx Real Estate in Las Terrenas. “You can get a beachside property for half, even a quarter, of what you’d pay in Turks and Caicos. So, tick the box for affordability! On a stroll through the oceanside community of Playa Bonita, you’ll spot pastel-colored boats bobbing in the water and pink and yellow cottages. This quiet fishing town has grown into a vibrant Spanish, French, and Italian expat community. European pastry shops have even popped up to serve the nonlocals, according to reviews on TripAdvisor.com. For sun seekers who prefer something far away from the madding tourist crowd, Bonita is best. To purchase real estate here, Americans need only to present a copy of their passport. Expats can score two-bedroom condos for between $230,000 to $300,000—a sweet deal, considering many of these homes are within walking distance to the ocean. While most of us are grinding away at our 9-to-5s, the residents of Caye Caulker, a tiny island a few miles off the coast of Belize, are relaxing in hammocks or swings right above the shallow ocean waters. Or perhaps they’re snorkeling with manatees right off the shore. 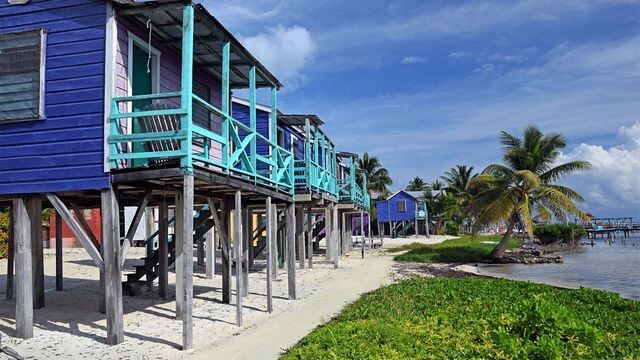 It’s simple to see why the population of Caye Caulker has doubled from 1,000 to 2,000 over the past decade. This lovely isle is dotted with bright, colorful homes and shops. But what really draws people to this destination is its affordability. It’s known as a budget island where housing and food are both cheap (even if finding a hotel with air conditioning is challenging). The home-buying process is simple and similar to that of the U.S. Luxury condos here sell for around $200,000, while five-bedroom homes right on the beach go for around $400,000. If you’re OK with a short walk to the beach, you can find something under $200,000. Still not convinced? Caye Caulker is right next to the Belize Barrier Reef, perhaps the best place to snorkel in the Caribbean. On the hour drive from Port of Spain—Trinidad and Tobago’s capital city—motorists wend their way through lush green trees and spot wildlife in the country’s rainforest. They eventually wind up with an awe-inspiring view of Maracas Bay and its beautiful blue waters. There’s no language barrier for Americans here—the official language in Trinidad and Tobago is English. The local grub is solid: There’s everything from flavor-packed stews to tasty curries (fresh callaloo, anyone?). And there’s a sizable American expat community, with many members living in the Port of Spain area. There’s also a growing group of expats in Maracas Bay, where locals can take a boat ride out and snorkel on its coral reef. Foreign home buyers must acquire a license before completing a property purchase in Trinidad and Tobago. Three- and four-bedroom homes in the hillside with ocean views can top $600,000. However, these homes can offer a nice return on investment if used as a rental. On Airbnb, a two-bedroom home is listed for around $275 a night—which is nearly $100,000 a year if fully booked. 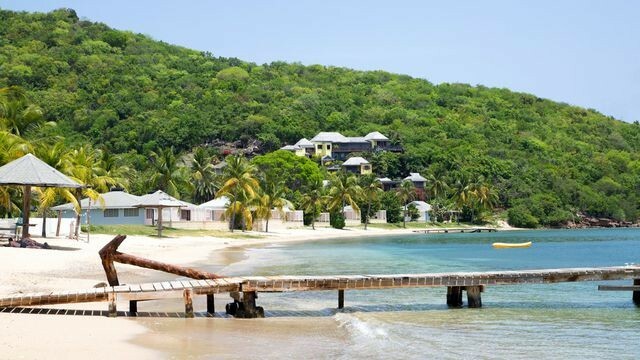 Crane Bay is home to Crane Beach, routinely recognized as one of the prettiest beaches in the Caribbean. In fact, last month Condé Nast Traveler named it among the top beaches to visit this winter. For those who want an adrenaline rush to go with their tan, there are plenty of options. 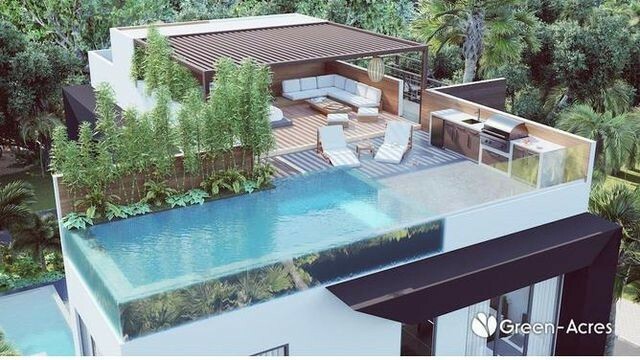 “There are cliffs that are maybe 20 or 30 feet up that people like to jump off,” says Richie Quintyne, a real estate agent at Nvest Estates in Barbados. However, this Barbadian dream doesn’t come cheap. Most condos with ocean views and a short trek to the beach start around $600,000, and a few top $1.5 million. Americans are treated just like Barbados citizens when it comes to buying a home, including having the same transaction costs and taxation. 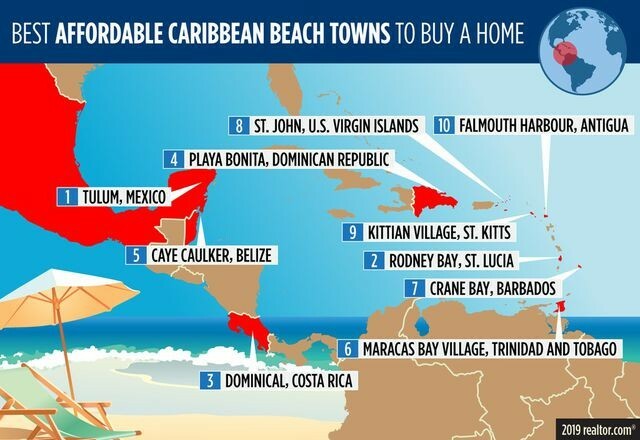 But as with many Caribbean home purchases, you’ll need to be ready to pay in all cash. According to Quintyne, Barbados requires foreign buyers to have funds upfront. At just 20 square miles, the tiny island of St. John got rocked by Hurricanes Irma and Maria in 2017. The dual disasters actually lowered real estate prices in this idyllic place, the shining jewel of the U.S. Virgin Islands—and quite possibly the most naturally beautiful isle in the Caribbean. “The hurricanes that hit 16 months ago were catastrophic, but the recovery has been pretty amazing. I’ll have people come that had no idea we were hit,” says Jenn Manes, a tour guide and owner of local blog News of St. John. So there’s a window of opportunity for buyers who were previously priced out of the market. Homes a short drive from Trunk Bay, perhaps the island’s best known and most breathtaking beach, can range from $800,000 to over $4 million. And the island is a U.S. territory, remember? So home buying is as straightforward as can be. The smallest of the three U.S. Virgin Islands, St. John has no airport. Most residents fly into nearby St. Thomas and take a 20-minute ferry ride to get to their homes. Note: Hurricane recovery is still underway with some residents still living in homes without roofs, windows, or, in some cases, walls. But for buyers who don’t mind an island on the mend, the payoff might be worth it. Facing the Atlantic side of tiny St. Kitts, Kittian Village is dotted with beachfront condo developments and hotels. It’s also a popular stop for Caribbean cruises. But don’t worry! Its beaches in Frigate Bay, a long oval-shaped bay, don’t get overcrowded. A bit away from the beach, mansions with pools and a guest cottage can exceed $4 million. But a furnished duplex could run as low as $250,000. To purchase real estate, most Americans acquire a land-holding license, which requires hiring a local lawyer. If you can pull yourself off the beach, you can keep yourself busy zip lining at nearby SkyTrek Safaris, shooting craps at the local casino, or frolicking with dolphins. While hiking Shirley Heights, a set of hilltops in Antigua, you can revel in the breathtaking views of Falmouth Harbour and its beaches. You’ll see snorkelers at the reef off Galleon Beach, in search of lionfish, sea turtles, and other exotic aquatic critters. However, homes in Antigua are not exactly bargain-priced. Just a plot of land a ways off from the beach can easily exceed $500,000. Foreigners have to obtain a license before purchasing property in Antigua, a process that can take more than three months. And they also have to pay a final fee of around 5% of the home’s value. On the sunny side, Condé Nast Traveler named Galleon Beach one of the world’s top beaches just last month. And folks who do make the plunge can contemplate life while sipping rum punches from bars set up right on the beach. Think about that while scraping ice off your windshield this winter.